The designations employed and the presentation of material in this publication do not imply the expression of any opinion whatsoever on the part of the Food and Agriculture Organization of the United Nations concerning the legal status of a country, territory, city or area or of its authorities, or concerning the delimitation of frontiers or boundaries. All rights reserved. No part of this publication may be reproduced, stored in a retrieval system or transmitted in any form or by any means, electronic, mechanical, photocopying or otherwise, without the permission of the copyright owner. Applications for such permission, with a statement of the purpose and extent of the reproduction, should be addressed to the Director, Publications Division, Food and Agriculture Organization of the United Nations, Via delle Terme di Caracalla, 00100 Rome, Italy. 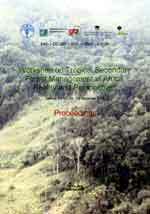 This document has been prepared on the basis of the findings of the workshop "Tropical Secondary Forest Management in Africa: realities and perspectives"; 9-13 December 2003, Nairobi, Kenya. Copies may be requested by e-mail or by writing to any of the contacts above mentioning "Proceedings, Nairobi Workshop" and the number of copies required. 3. WHAT ARE SECONDARY FORESTS?